Superior quality and complete compliance with customer specifications is assured by PTI's extensive laboratory testing and inspection procedures. PTI couples Statistical Process Control (SPC) and state-of-the-art test equipment to yield parts that are processed to the highest standards available. Oxygen and a fuel gas are combusted and through nozzle design and torch design are accelerated to very high velocities. 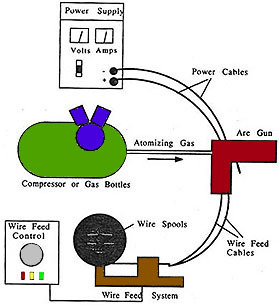 Popular fuel gases include Hydrogen, Propylene, Acetylene, and Kerosene. HVOF has become the quality standard for carbide and cermet materials as gas velocities over 6,000 feet per second allow particle velocities over 3,000 feet per second. The result is coating approaching theoretical density with bond strengths above 10,000 PSI. Since gas temperatures are on the order of only 6,000 degrees Fahrenheit this is not an appropriate way to apply ceramic materials. PTI has done considerable research and development with HVOF equipment and supplies something over forty coatings with these devices. The level of quality PTI supplies with these devices is among the top two or three in the industry. In the case of each of these coating techniques PTI sells coating used in the ´as coated´ condition to mirror like surface finishes depending on application requirements. Typical power levels employed are 40-80 KWDC. The additional energy available, coupled with slightly modified torch design, translates to both higher thermal energy and higher particle velocity. The result is more complete melting of high temperature materials (ceramics) and greater integrity of the resultant coating. PTI applies something over two hundred coatings by the complementary plasma techniques. 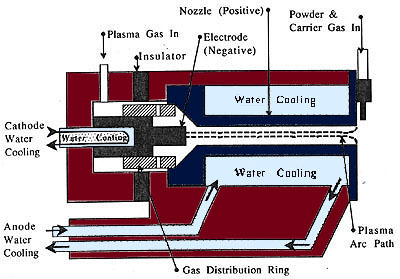 There are thirty-two significant variables in the plasma coating process. The manipulation of these variables enable coating properties to be tailored to meet the properties desired for each application. It is the control of these variables that determine the repeatability of the process. 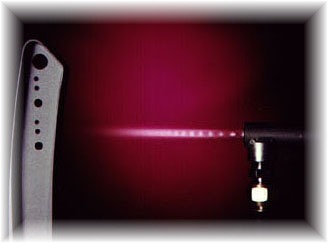 A high temperature plasma stream is created by non-transferred plasma arc within the torch. Many gases may be ionized this way, argon or nitrogen with small additions of hydrogen and helium are popular choices. In an ionized gas, free electrons have been stripped from the atoms and recombination releases very significant thermal energy. 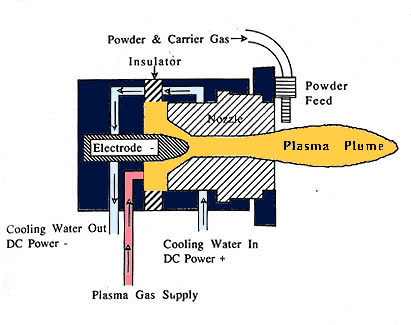 The plasma stream can reach temperatures of 10,000-50,000 degrees Fahrenheit. Oxygen and a fuel, usually acetylene or propane, are accurately mixed and burned. 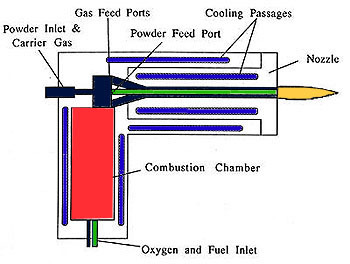 A feedstock material in either wire or powder form is concurrently fed into the torch and accelerated to the substrate by concentrated compressed air. PTI applies about 20 coatings by this technique, frequently for low performance requirements or soft materials that are intended to abrade. In Wire Arc Coating, the starting wire feedstock, usually 1/16 in diameter may be composed of essentially any material that can be purchased at this size. Two wires with an electrical potential are brought together at an angle of about 20 degrees. A current is drawn through the wires and they 'melt' at their point of contact. An atomizing gas propels the molten particles at the substrate at low velocity. PTI applies about 10 different materials by this technique.